The QBrand QBlog: Brand extension: A case of twisted logic? In 1982, I lived in a shared student house in North Melbourne that enjoyed a collective obsession with Twisties (among many other quirks that I won’t go into here) and a ritual that involved tying up the empty Twistie bags in a particular way, then displaying them in a large fishbowl. Only one pack size would do. And definitely no chicken flavour – only cheese was acceptable! Any Australian will tell you Twisties are a cheese-flavoured cereal-based snack manufactured by an extrusion process that results in portions of an irregular and gnarled or knobbled appearance (as officially defined in the Federal Court). Like Vegemite, Twisties is an iconic and quintessentially Australian brand that evokes the taste of home for expats and – like Proust’s madeleine – often leads adults to fondly recall childhood experiences. What Australian of a certain age doesn’t remember the taste and texture of a Twisties-filled buttered roll from the school tuck shop? Or is that just me…? 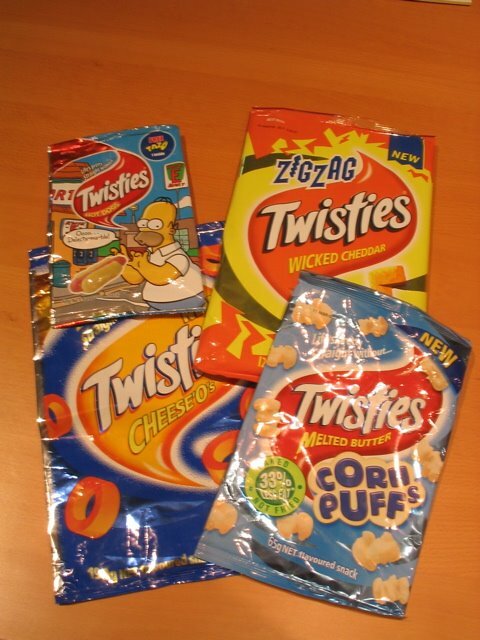 Anyhow… in recent months I have amassed a collection of products now being sold under the Twisties name that bear little or no resemblance to the “flagship” or “anchor” product for the brand: popcorn, rings, zig-zags and even hot dog shapes, in a range of flavours. The Smith’s Snackfood Company is at least half right in recognising that the brand equity of Twisties resides primarily in intangible brand associations carried in the minds of consumers. But it doesn’t necessarily follow that the Twisties brand can therefore be extended to any type of snack food. There are two critical risks from an undisciplined approach to brand extension. Firstly, extensions have feedback effects on the parent brand. The more disparate the products the Smith’s Snackfood Company tries to position under the Twisties brand umbrella, and the poorer the perceived fit with the parent (popcorn?! ), the greater the risk that the Twisties brand will lose distinctiveness and meaning. Second, brands with rich cultural connections (as per my earlier anecdotes) engender not only strong brand resonance but also a deep sense of “ownership”. Want an example of consumers taking back “their” brand? Try buying a can of New Coke!